I am so happy you clicked through to come visit me. Maybe this is just what you need today, in this season, whatever it is. I hope these words find you, right where you need to be. I see my friends, in real life, face-to-face and on social media, I see you struggling, like me, to make it through this hard and weary road, through our wildernesses and our fiery trials. We are feeling crushed, we are feeling hard-pressed on every side and in a tough season. Some of us are going through extraordinary stuff, some of us are just going through pretty ordinary stuff but it is just so hard. We are feeling the pressure-cooker of trials and we are ready for seasons to change, ready to make it to the other side. I feel it too. I know what it is like to face a New Year's Eve praying "God, I can't make it through another year like that." And I know what it is like to get to the next New Year and realize that things actually got worse. I know what it's like to feel like I'm hanging on by a thread. 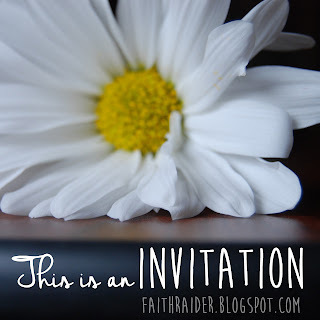 An invitation to something that is maybe new. An invitation to be free, to walk lightly and to live openly in this broken, messy world. An invitation to choose brave. In the middle of the hard. In the middle of weakness. Can we sit here together for just a moment and try to imagine what it might look like to live a life that is not ruled by insecurity? What if you and I learned to stand stronger in our faith and choose love over fear? Close your eyes. Take a deep breath. Can you see it? What does it look like? It's okay if you can't even imagine it. I'm right here with you. If I'm honest, on a clear day, I can only vaguely make out the shape of it in the distance. It can be hard to see. It's not just David facing Goliath, or Moses at the Red Sea, it's not only Peter or Paul leading the way for the early church. It's not only Esther before the king, saving her nation from certain death. They were all amazing men and women and obviously brave characters in the unfolding story of God's redemption of His people. But during the next 31 days we're going to look at some of the more unexpected characters of the Bible who showed bravery in smaller, quieter ways. In Hannah, getting up out of her grief and surrendering her desires to God. It's Ruth in the fields choosing love in the mundane day after day after weary day. Writing this series has felt nothing like what I thought it was supposed to feel like. It hasn't been written at a pretty desk in the rays of a rising golden sun, with a nice little stack of commentaries at my side, washed over by peace and joy. These post feel like scribbled notes from the bomb shelter. These posts have been tapped out on my cell phone as I empty the clothes dryer and as I make dinner or wash dishes, while sitting in the parking lot of the Library or wrapped in a towel sitting on the edge of the tub. I'm a mess. Honestly, my life feels like two steps away from total, epic disaster, but maybe you can relate to that. I was struggling with this a lot when I first started writing this series. I felt like my life should feel more "together" and at least a lot less desperate. I was sitting on the floor with my sister one day when I'd only been able to squeak out a few notes. I told her that I thought that someone who was actually brave should be writing about being brave, and not someone who was struggling to fight fear every single day. A few days later I felt God whisper that I am exactly where He wants me to be to write this, that my circumstances were not an overlooked detail of this plan, but exactly what He wanted. That He wanted me to write from this position, and from this posture. So here I am. Because being brave isn't about temperament or bravado. We make a choice to be brave but that choice isn't essentially the thing that makes us brave, it is God who makes me brave, it is the Holy Spirit at work within me changing the landscape of my mind, and brining healing to the shattered places in my heart. I choose to be brave and I choose to cooperate with the Holy Spirit who is at work within me cheering me on to choose to be brave. The Holy Spirit walks along side me and within me reminding me of the big picture and the plans that God has for me that can not be walked out in fear but rather in faith. To choose brave is to choose faith, hope, love, joy! It is to reject fear and anxiety as controlling forces in my life. It's knowing that it's not all up to me to be brave. I think this is freeing, it takes the burden off of my shoulders. I can turn to my Heavenly Father and say "Yes" when He calls me deeper, confident that He supplies the grace I need for whatever He calls me to do. Even if it feels scary. So why am I writing this? I am writing this for me - because right now I desperately need to remind my heart of who God is and what He has done for me, and who He will keep on being and what He will keep on doing. Because I need Him to be that for me now - in the middle of today's mess and heartache. But I'm also writing this for you, whoever you are, whatever your circumstances might look like, because chances are you know what it's like to feel like God is calling you to be brave. And you probably know what it's like to feel very un-brave-like. My one desire for this series of posts is, above anything else, that this would become a collection of moments when you met with God. May the Holy Spirit come and fill these pages on your phone or tablet or your laptop or printed out and stuck in a tote bag, with His words to you. This series has absolutely nothing to do with "right" answers, there are only meant to be honest conversations with God. It's about coming to God bare-faced and open-handed with all of our jumbled tangle of thoughts and feelings and letting Him set us right. Because I believe God is calling us all to be brave. Brave in our abundance, brave in our emptiness, brave in the noise, brave in the silence, brave with our words, brave with our actions, brave with our stories, brave in our faith - in whatever circumstances we find ourselves, wherever God has brought us. We all have places in our lives where we daily have to choose to be brave. I want to just reach through the screen and give you a hug right now. If I could I would sit down with you and hear about what is going on in your life right now. I want to hear, because I know that what God is doing in my life right now is, well, a lot, and chances are there's a lot going in your life too. And if not, that's cool, please take a sec and read this. If you want to share what's going on with you (and commenting on a blog is a pain) you can connect with me via Instagram, Facebook or Twitter (in that order) or my inbox is always open. I want to hear how you are learning brave, or needing brave. Pretty much every post will have a song that has meant a lot to me. I hope that you'll take a moment to listen to them, and as you listen to them listen to what the Holy Spirit is saying to your soul. If these songs aren't your jam, please don't be offended - let me know what you're listening to (and share it with me on Spotify). The next posts won't be quite so long. I promise! If you want to you can get follow up posts in your email. I would also love it if you could take a moment to sign up for my newsletter. on November 1st I'll be sending this post series out as a .pdf to a group of Beta Testers. Want to join in? Oh my stars, how long has it been since I have actually read and commented on a blog?! I feel refreshed just being here. I love your transparency, and will be praying you through this! Hugs, sweet friend!